Paperback, with flaps, 256 pages, 13.5 x 21.2 cm, 5.3 x 8.3 in. An estimated 15 to 20 percent of the world’s population is highly sensitive. HSPs (Highly Sensitive Persons) perceive the world in a more intense, detailed, and precise way and need to process more sensations. Yet HSPs often do not know about this unusual condition, which is often falsely diagnosed or is considered a weakness, even by the HSPs themselves. This book clearly illustrates the phenomenon of high sensitivity and describes how HSPs experience everyday situations such as shopping, going out, school, and work. 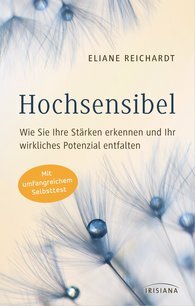 The book focusses on creating a better self-understanding and thus an improvement of the life situation of highly sensitive people.